I’ve been volunteering with the Howard Area Community Center food pantry since April. It’s been an incredible experience. I’m enjoying it so much that I’m disappointed when it’s a holiday and I get the day off. Volunteering here is special. This is one of the most diverse neighborhoods in the country. The food pantry serves long-time Rogers Park residents and recent immigrants from around the globe. The volunteers and staff, like the clients, come from diverse backgrounds as well. Every day I’m there, I learn something new and interesting. It could be something fascinating about the history of Ghana or something as simple as a better way to tie the produce bags. In addition to the conversation, the work itself is meaningful, and also fun. I’ve had the opportunity to work in sorting and packing, client intake and senior center deliveries. Each is remarkable in it’s own way. Something about the packing itself is almost meditative. While counting eggplants, tomatoes, cucumbers, mangoes, pineapples, cantaloupes, cauliflower, or corn, I imagine the meals people will make with the food. My first day in intake, I met a mother who recently immigrated from Syria. She moved here 18 months ago with her husband, young children and extended family. Without speaking the same language, we were able to communicate about the needs of her family. Her smile reflected a deep appreciation. Whenever I deliver meals to the senior center my favorite thing is the residents’ sense of community. They inform us of their peers’ wellness and if a neighbor isn’t there to greet us, they will find them to make sure they don’t miss the delivery. I get at least as much as I give here. I’m so glad I took the step to volunteer. 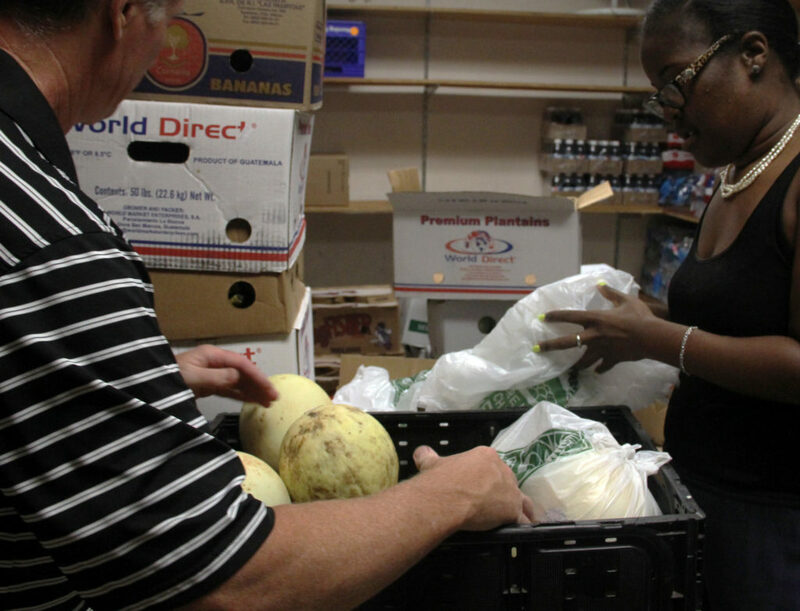 The Food Pantry is the cornerstone of HACC’s work and history. The Food Pantry feeds nearly 12,000 low-income families and individuals every year. Many of the Food Pantry’s frequent visitors are homeless and in poor health. The Hunger Walk on September 8th is one more opportunity to support the great work of HACC and the food pantry. For every person that walks with HACC at the 33rd Annual Hunger Walk the Greater Chicago Food Depository will contribute to Howard Area Community Center.